Simplicity can be so "elegant," and cheap. Cheap. That’s me... sometimes. Other times I’ll spend money like a drunken sailor. It’s odd the times my miserly instinct kicks in. For example, the other day I was at the grocery store. Bread was on my list. But as I scanned the prices I couldn’t bring myself to put a loaf in my basket. $3.99? For a loaf of bread? It’s patently obvious that man cannot live by bread alone. Man can hardly afford it. So then was the time to call on the wisdom of Emerson. I could make it myself. Obviously my coffee hadn't kicked in. To make bread, all you really need is four ingredients: flour, water, yeast and salt. That’s it. I know that many of you “out there” will be saying you can’t make bread. It fails. There’s two important things that can make bread fail. One is your yeast, the other is your temperature. Thing 1: To always have fresh yeast on hand, buy a cup or even more at a bulk food store, put it in a jar and stick it in your freezer. It won’t kill the yeast. it will start to activate the moment it hits warm water. Thing 2: The water used to activate your yeast has to be *at most* 115°F. Any higher and you risk killing the yeast – something freezing couldn’t do. Proper temperature water is slightly warmer than the temperature of a baby's bottle. Or better yet, use a thermometer to test it. If your yeast doesn’t proof (either too old or killed by heat), your bread won’t rise. It’s as simple as that. Normal room temperature will raise bread every time. Cover the bowl to keep it relatively dark, and don’t sit it in a draft. I went one step further with this and made an overnight starter. It’s not necessary, but does add a bit of a nice rich flavour, sort of like a sourdough. 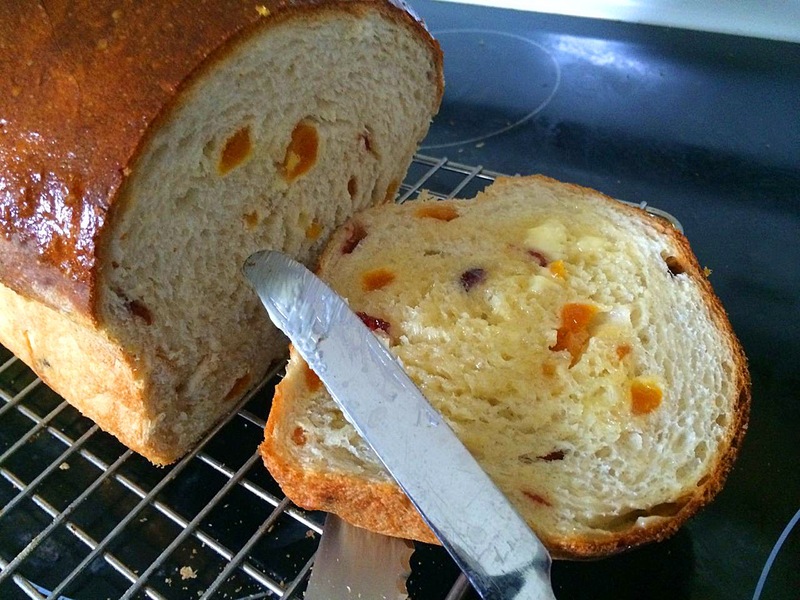 My bread recipe today is a bit on the “fancy” side for another reason, too – it has dried apricots and cranberries. 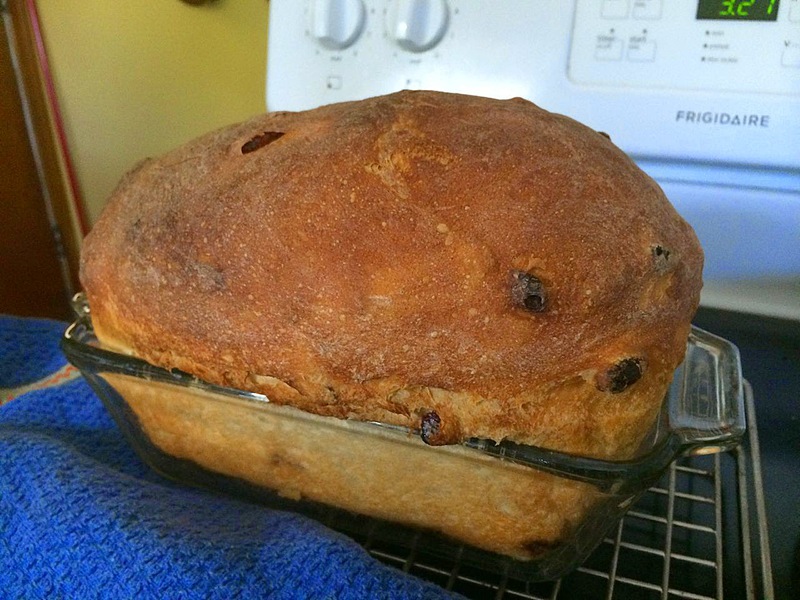 In truth, I was going to make raisin bread, but I didn’t have any raisins, so I had to raid my mother’s pantry. Left: before first rise; right: after first rise. The night before you want to make your bread, mix together the starter ingredients. Cover with plastic wrap and a towel and let sit until morning. By morning it will be a bubbly mass. In the morning, add the remaining ingredients and stir well. It will be very wet and sticky. Remove the dough to the counter. Slap and fold the dough until it no longer sticks to your hands. This step will be very messy, but it will actually start to stick to itself as opposed to you. Shape into a ball. Butter a bowl, place the dough in it and proof until doubled in size. Left: before second rise; right: after. Easily doubled. It possibly would have risen even more. Once doubled, scoop out onto the counter and knead for about 2-3 minutes. Generously butter a 5x9 loaf pan. Shape the dough into a log, place in the pan and let it rise until doubled again. Tent a plastic shopping bag over the dough while it rises. For a soft crust, rub the top with butter. It's optional. Just before you are ready to bake the bread, preheat the oven to 425°F. Make sure the oven rack is in the centre of the oven. Place a pan of water on the bottom rack while the oven heats. Bake the loaf for 35 minutes. Remove the water pan after the first 5 minutes. The loaf is done when nicely browned and sound hollow when tapped with your fingers. Rub the top of the loaf with butter if you want a soft crusted bread. what a beautiful loaf of bread!! 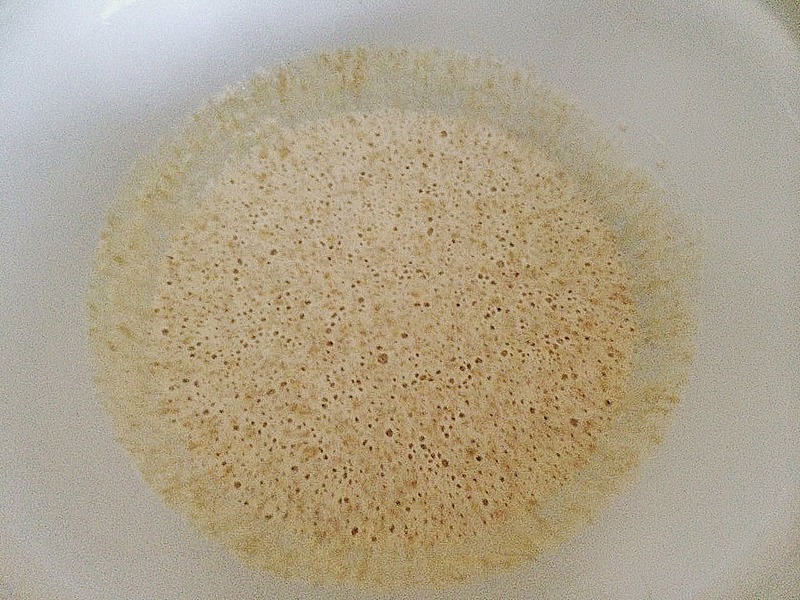 i have honey buttermilk bred rising right now. i can't buy store bought bread anymore. i can't stand the smell of the chemicals in it. plus, bread is so easy and satisfying to make.